Thank you One2One Network for letting me participate in this sponsored campaign. All opinions are 100% my own. There are few things parents do not look forward to in their children's lives. Going out of town or even the state for college is one, but I avoided that my son, Anthony, goes to school at our local University, Fresno State to be exact. What I didn't expect was his decision to move out before his second year of college. I mean I knew it was coming, but I thought he really wouldn't for a (long) while. I know it sounds dramatic because he's only a few miles away but now he's really on his own! For years we were the ones that woke him up when his alarm would annoy us early, morning after morning. Now he needs to make sure when he wakes up he will stay awake. Lucky for him I was given this awesome opportunity to give him an wonderful gift. A beautiful Keurig! A Keurig K10 MINI Plus Brewing System that came with some Kcups for him to try as well. 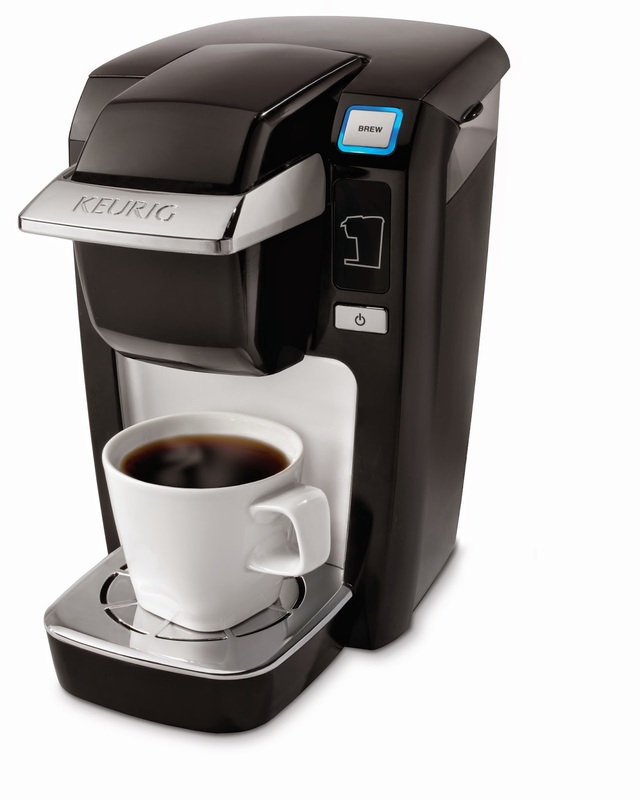 This Keurig K10 MINI is affordable and available in a variety of colors. I forgot to mention above about Anthony's roommate who also happens to be his girlfriend, Sharolyn, they will both actually be using this because she's also a sophomore at Fresno State. 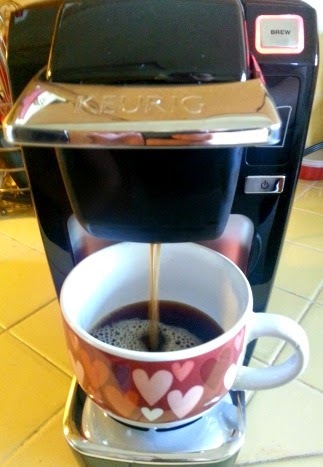 The Keurig will definitely help keep them both awake during classes, while studying or when they need to run errands. 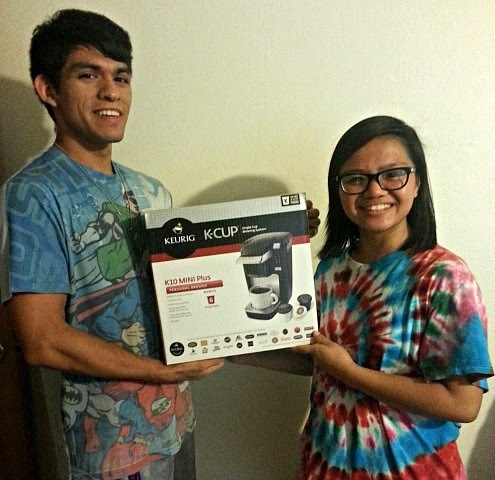 They were really happy to receive a Keurig, I missed getting a picture of their faces being shocked. They were embarrassed about how they were dressed, but to me it's typical college attire. So after the shock wore off we talked about the fact that there are over 250 varieties of K-Cups from 40 plus brands! It's not just a coffee maker, you can also make cocoa, tea, even juices. Sharolyn is already familiar with how to use a Keurig but my Anthony had no clue! We explained how easy it is and how fast you can make a cup of coffee. In just under 5 minutes they can both have brewed their own cup. No more compromising on his or her brand of coffee. So far they are loving the Keurig K10 MINI Plus and trying out K-Cups! If you're a parent of a child leaving for college or already attending this would make a great gift. Not only is it a fast way for them to make a tasty beverage and it doesn't take up much space either. You can also look into giving them one with their college decal on it or a colored one that will match their decor! Here's an A+ way to start the school year off right—Go to Keurig.com and enter promo code JUSTBREWIT to get 20% off all MINI Plus Brewers PLUS a free 22/24 count box of K-Cup® packs. That's the school spirit! 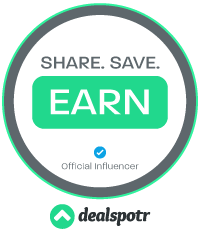 Valid until 3am ET/12am PT on 8/29.